Equity is the current value of your property minus the amount of liens against it. If you own property that’s worth $350,000, and you have a mortgage with a balance of $100,000, your equity in the property is $250,000. Many home buyers often rely to some extent on the equity in their current home to help buy their next home. The more equity you have, the greater the possible down payment for a trade-up home. Home equity can equal security. The more you have, the better off you are, and the more stable you feel. So let’s talk about how to build home equity faster. 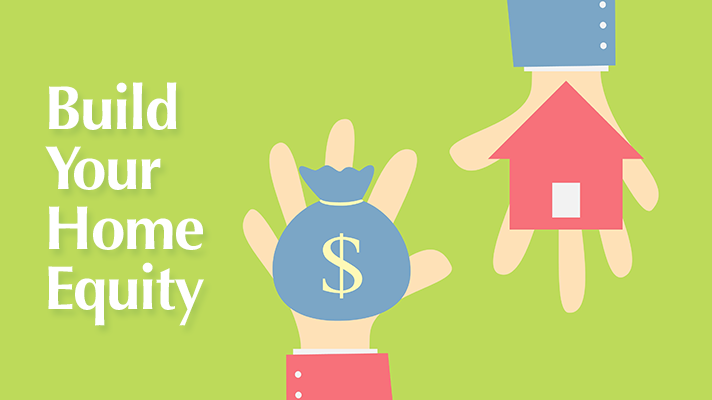 Building home equity comes at a price, typically in the form of a larger mortgage payment. A trap that you definitely want to avoid is becoming house-rich and cash-poor. If building home equity means incurring too much debt to live comfortably, then you’ve defeated the purpose of building home equity in the first place. A good option in building your home equity is to make additional payments toward your principle. One way to do this is to see if your bank or mortgage company offers a bi-weekly mortgage. That’s when you make two payments per month (which added together equal one monthly payment). You will make the equivalent of 13 monthly payments per year instead of 12. That gives you an extra mortgage payment per year. A 30-year loan with a bi-weekly payment plan is usually paid off in about 20 years. Before you start making additional principal payments, you should use an amortization calculators you can find on the internet to do the math—how much interest you would save if you made additional principal payments, and how much it would shorten your loan and increase your home equity. Another way to build equity faster is to refinance. Recently, the reason most people have refinanced is to lock in a lower interest rate and/or lower their monthly payment. But you can also refinance to shorten the term of your mortgage, which builds equity. The down side to this is that a 15-year mortgage is harder to qualify for than a 30-year. See if you can swing a shorter term loan with the refi. If you still owe over 25 yrs, look into a 15 or 20 year loan.. It will increase your payment, but you’ll pay off your loan faster. But what if you can’t afford a higher house payment? Your next best means of building equity is to refinance for less than 30 years. To do so, ask your mortgage company to customize your new loan's term to match the years that are left on your old loan - if you are five years into a 30-year mortgage, for example, ask for a 25-year loan. You probably won't receive the entire amount of your equity as cash when you sell your home. Most sellers use part of their equity to pay selling costs, such as brokerage commissions and transfer taxes. If you’re thinking about selling your home in the near future, please contact me.